Hillary Clinton’s promise to go after “High-income money managers…[who]..use loopholes related to foreign reinsurance – often located in Bermuda – to avoid paying their fair share.. [of US taxes]” and saying that she would “end the Bermuda reinsurance loophole” is a serious statement from a serious contender for the US Presidency. As a statement of clear political intent, it is similar to Presidential contender Donald Trump’s December 2015 promise to bar all Muslims from travelling to the USA. Both are like shotgun blasts from a police weapon into a crowded room where one unidentified fugitive is said to have taken cover. Insurance/Re-Insurance means that somebody, somewhere, agrees to pay a huge bundle – millions and billions of dollars – to someone who has paid an insurance premium to insure themselves against some kind of risk. If the risk turns into an ‘event’ – that Insurer/Re-Insurer must have immediate access to the millions or billions that the primary insurer had agreed to pay. The Re-Insurer pays the primary insurer and the primary insurer pays the policy-holder. An excellent example of that is the 9/11 World Trade Centre event. In a first time ever event, terrorists blew up the twin towers and killed thousands of Americans and others. Within ninety days of that event, and leading as the first to settle, Bermuda Insurers/Re-insurers had paid up their agreed portions of the huge insurance claims bill that the event created. That fast claim settlement represented the normal working methods of Bermuda’s group of insurers. How much? About $2.48 billion [about 9.0%] of the total $26.8bn paid. And it is here where the realities of the Bermuda Re-Insurance and Insurance markets clash with the complexities of tax regimes in the USA, the Commonwealth generally, the EU, and elsewhere. Fred buys his insurance from an insurer – call the company ABE. ABE agrees to accept the risk for a premium of $50,000,000 [$50 million]. So ABE pockets $50 million, then sweats out the time, hoping that nothing happens to the FT. Meanwhile Fred sleeps well because he is now ‘insured’. Thirty days later, on X-day, around 0900hrs, terrorists strike. By 1200hrs on X-day, the FT is a total loss. At 1201hrs on X-day, ABE the insurer, must now be ready to handover $1.0 billion cash. That $1.0bn is made up of the $50 million premium from Fred plus $950 million that ABE must suddenly produce. Where other countries tax regimes get involved goes straight to the $950 million that ABE must always have ready-to-hand to cover its obligations; as happened with ‘9/11’. Somebody, some corporation, somewhere, must first have that $950 million in easily liquidated assets. And that $950 million of ‘cash reserves’ must be readily available to meet all the policy terms. Cash reserves of that size can only be amassed by large corporations who put their shareholder dollars at risk; or groups of wealthy persons who put their personal wealth at risk. Essentially, these wealth holders are prepared to ‘park their money’ – and possibly earn a few dollars from low interest rates – while ‘betting’ their money that no terrorists will strike or ‘acts of God occur’. If ISIS or God don’t interfere, they make a profit. If God or ISIS do interfere – it’s pay-up ‘my man’, and they lose a big chunk – or all – of their ‘parked’ money. The politicians in the USA, Canada, EU want to get their hands on the ‘parked’ money. They want it parked in their jurisdictions so they can tax it and further enhance their government’s revenue. But that would decrease the amount of money parked and therefore increase the size of the premium that [Fred] would have to pay. It’s the same kind of choice you make when you park your car [in Hamilton?] after you’ve driven in to work. Park here, it’s $10 a day. Park there, it’s $15 a day. The $15 car park is closer. Good on a rainy day. The $10 car park is further away. Not good on a bad day. But how many bad days are there? The expensive park benefits the cash-strapped Corporation of Hamilton. The less expensive park benefits you, but you suffer on bad days. Like anybody, the people/corporations who own the ‘parked’ money want to protect and maximize their gains on their amassed wealth. So they choose the ‘park’ where their money will be safe, easily accessible, and not nibbled away at by taxmen. Those persons and corporations who choose to ‘park’ their money as investments in Insurance/Re-Insurance corporations based in Bermuda are doing nothing wrong or immoral. That is supported by almost ninety years of similar legal rulings forming and solidifying an almost universal basic right to lawfully minimize personal and corporation taxes. Overall, if the money invested in Bermuda based insurance corporations was forced to be parked within the USA or UK or Canada or EU, then there would be a general global increase in all insurance premiums. The French Government recognised that about two years ago and backed-off their attempts to get at French investors in Bermuda based Insurance entities. People in the USA, the Commonwealth, and the EU should recognize fact and reality and do the same. Bermuda is a big player in global Insurance/Re-Insurance. Bermuda’s settlements of more than $20 billion for the US events of Hurricane Sandy provided more than 33% of the total claims settled. More than $6.0 billion between them for the 2005 events of Hurricanes Wilma, Rita; and covered more than 25% of the total paid-out for Hurricane Katrina. Bermuda based insurers currently back about 25% of all medical liability insurance/re-insurance in the USA. Bermuda insurers will likely be covering some of the recent flood damage in Alabama. 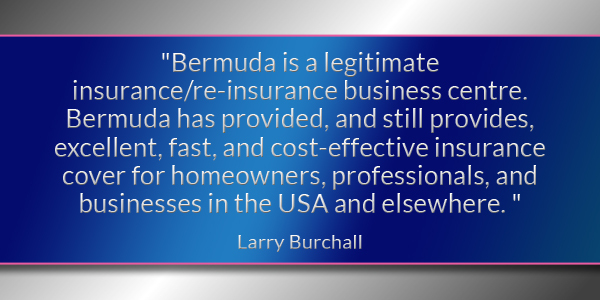 Bermuda is a legitimate Insurance/Re-Insurance business centre. Bermuda has provided, and still provides, excellent, fast, and cost-effective insurance cover for homeowners, professionals, and businesses in the USA and elsewhere. Bermuda does this within the full ambit of the laws of the USA, UK and the Commonwealth, and the EU. Bermuda has been providing Insurance/Re-Insurance cover for over fifty years – since the 1960’s. 31 Dec: Column: What Has Been Achieved In 3 Years? 10 Dec: Column: Most Wonderful Time Of Year, Or Is It? 26 Nov: Column: Who Is Dr Ryan T Anderson? Very well said, with simple examples. Very well written, but at the end of the day, if SHE gets in and if SHE closes the loop hole, the insurance prices will simply go up all over the world BUT what will happen to Bermuda???? The REALITY is again raising it’s ugly head as it does in every election. And the REALITY is not pretty for Bermuda. It is like a hurricane coming across the Atlantic! It is a HUGE political risk that every re-insurance company is “sweating out the time” as Fred did in the example above. I don’t think this Government is taking this risk very seriously. IF it were to happen, we would have to resort back to tourism as our main and only industry. Are we all PREPARED??? When all else fails, we could become the 51st state of the U.S.A. That move would solve the problem for everyone . Who knows, they may still allow us to have tea at 2;00p.m every afternoon.